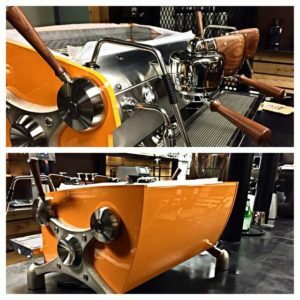 At the heart of Retrospect is a bright orange Slayer espresso machine hand-built in Seattle to Retrospect’s custom specifications. Our bright orange Slayer espresso machine! Every effort was made to source roasters and vendors close to home, including Boomtown Coffee, Amaya Roasting, Katz Coffee, Pura Coffee, Pearland Coffee Roasters, Camellia Tea, and Geva Premium. A limited but thoughtful menu of sweet and savory crepes are served all day, each named after a different icon of Texas history – including the Lady Bird Johnson with sliced turkey and goat cheese, and the all veggie Janice Joplin. A rotating list of craft beer is on offer, as well as eclectic range of wines by the glass or bottle. And for fans of handmade frozen custard, Retrospect will carry a full line of Honeychild’s Sweet Creams, including a special flavor just for us the “Orange Dreamsicle”.